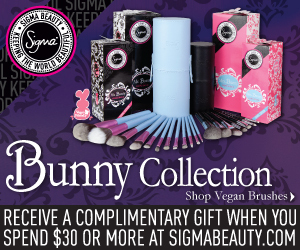 Sigma Beauty Affiliate Program: The Bunny Collection: Vegan-Friendly Brushes! We are very excited to share our new synthetic brush line with you! The Sigma Beauty Bunny Collection was designed to deliver perfect makeup application using all synthetic brushes. The collection utilizes our exclusive Sigmax HD fibers, which guarantee perfect makeup placement without product absorption into the bristles. Share this information with your followers within the first week of the Bunny Collection launch to boost your sales! You can also update your blog with one of these great banners! Copy and save the image to your computer. You can then upload the image as a picture to your blog, and insert your affiliate link as the website! The Bunny Collection is perfect for vegans and those who prefer to use all synthetic brushes! Share this information with your followers and watch your sales increase! MAde a banner and also a post about it! I really wish you made a vertical banner.. none of these suit my site. are this the only vegan friendly brush sets they have? @Coisinhas da Kelly!!! and @Smashinbeauty Makeup Blog While we are not offering a Bunny Collection vertical banner at this time, we do have a wide variety of vertical banners available on our blog! Entrad en http://naura84makeup.blogspot.com/2011/12/bunny-collection-de-sigma.html Os gustará!!!!! I really want to try these because I love all my brushes with synthetic fibers but I am trying to spend less on myself and more on others this holiday season! <3 I soooo want them! As a vegan with a ton of vegan subscribers, I'd like to speak on behalf of all of us for a second: THANK YOU FOR THIS SET. =] The Sigmax collection is pretty amazing, but having a collection that specifically brings attention to the fact that there is a need on the market for VEGAN FRIENDLY synthetic brushes really, really makes me smile. Thank you for bringing attention to the cruelty free factor that's been missing elsewhere. I'd love to see more cruelty free brushes added to the Sigma collection (or replace non-vegan friendly options!). Again, thank you! The Mrs Bunny Is not on the site? Is It out of stock? @Madiha At this time the product is out of stock. We are expecting a shipment within the next week. If you would like to be notified when the product is in stock, please email contact@sigmabeauty.com with the request.